Explorer Custom Promo, Carousel, and Video Collections Featured/Lists now allows users to rearrange the order of objects. Click the textured area next to the object and drag above or below another object. To make rearranging items easier, minimize the items displayed by clicking the triangle to the right of the title. Prior to tonights deploy, users had to use the calendar in order to view the next day in the BentoTV Schedule. Now, users can continue scrolling on the schedule through to the next day. The video of last week's Passport Lunch and Learn is now available. Passport theme is customizable option which gives stations the ability to match their brand colors. There are up to 18 million different color options or stations can choose from pre-selected color palettes. We are interested hearing from you! What are your favorite websites? 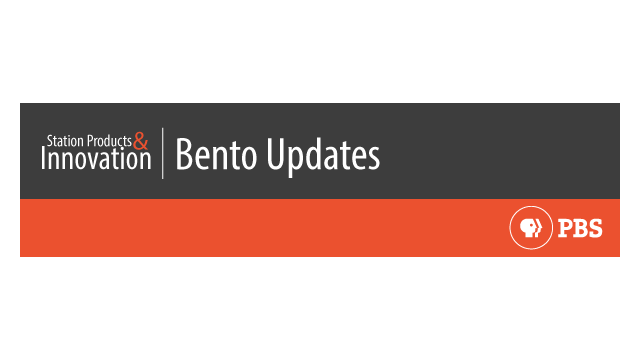 Get a tour of Open Bento, a community to help cultivate a more robust developer presence around station-created website features in Bento.